As we settle into this autumnal season, we are greeted with the visions of golden leaves on the ground, scarves around necks, and pumpkins on porches. 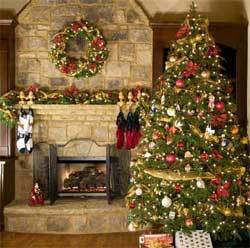 I wish there was a way to bundle it all up into one tangible embodiment of the season. Maybe there’s no way to hold autumn in our hands, but there’s still a way to capture it so we can smell it with our noses. Slice of Spice is the perfect olfactory manifestation of this season. 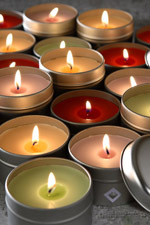 Burning a filled candle or warming some home fragrance oil fills the room with an aroma you can almost taste. 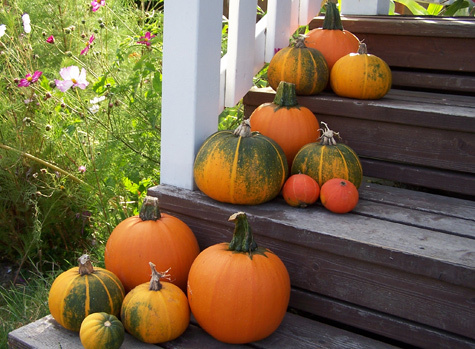 You can smell the fresh pumpkin as if you’ve just finished carving it in your kitchen. The hints of allspice and rum give it a woody bite. It’s topped off with the delicious scent of maple syrup and cream cheese frosting that make the whole room smell like Mom’s kitchen in November. It’s an inviting fragrance that keeps the house smelling like you’ve been baking, but without all the hard work. 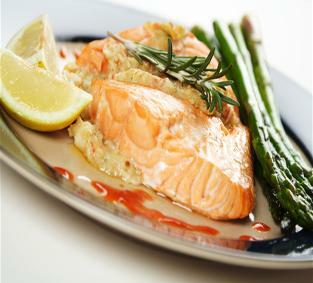 So fill your home with the warm, enticing aroma of Slice of Spice and let autumn wash over you! For example, a few nights ago, I had some friends come over for dinner. I had baked cookies earlier in the day and had just finished cooking the fish right before they arrived. I wanted my house to smell more like the cookies than the fish (obviously) but at that point, it was too late. My house smelled like a seafood restaurant. So I reached for my handy dandy Vanilla Bean Home Fragrance Spray and a few spritzes later, my home smelled like cookies instead of fish. If you want to freshen up a room quickly and keep the fragrance for a while, a great way to do that is to start with a few sprays of Home Fragrance Spray and top it off by lighting a filled or botanical candle to keep the fragrance steady. That way I have the ambiance of candlelight but I don’t have to wait for the room to fill with fragrance as the wax warms up and melts. I’ll always love my Home Fragrance Spray- I have a different scent for every room! Give ‘em a try some time! Give for the Holidays Before the Holidays! As we turn the corner from summer to autumn, and the leaves are changing from green to orange, our thoughts start to wander towards the holiday season. Everyone has his or her own reasons for loving the holidays. For some it’s the presents, for others its spending time with family, and for many it’s the heartwarming smells that accompany the holidays. The Christmas season is my favorite time to give Claire Burke®, whether it’s a botanical candle, a gift set, or a fragrance diffuser, Claire Burke® is always a hit around the holidays. However, I’ve learned from years passed that the heartwarming Claire Burke® holiday scents that I give as Christmas gifts only get a little use after Christmas before they are packed up for the next year. That’s why this holiday season I’m going to gift differently! This year I plan on bringing the holiday fragrances like Christmas Memories®, Oh Christmas Treeä, and Slice of Spiceä out long before Christmas passes. Rather than giving fragrances that will end up getting packed up with the rest of the holiday décor, I’m going to give these scents as gifts for Halloween, Thanksgiving, holiday party host gifts, house warming parties, and get togethers. That way they can be used for weeks or even months before the season changes and they may contribute to the aura of the season. Then for my Christmas presents, I’m going to gift from the Claire Burke® basic collection so that my gift can be used long after Christmas. My friends and family can love the holiday scents from October through December and then admire the classics for the rest of the year. If you want to make sure the gifts you give this season are enjoyed to their full potential, remember this, give for the holidays before the holidays! Fall is underway and leaves are underfoot with scrunching squeals and slippery steps. Not to mention children’s delight at new discoveries. The avalanche of summer plenty is there for us all to see and the Scents of Fall take on a new significance. A sense of purpose and a sense of direction is what defines the season for me. It’s a harvesting of the labors of summer and a chance to be thankful for all that nature has given us. Nature gives to us and we in return should harness this great bounty and in our own way not only give thanks but give gifts that convey our gratitude? What better than to fill your rooms and those of your friends with a gift from the gods that lingers and conveys the spirit of the season? 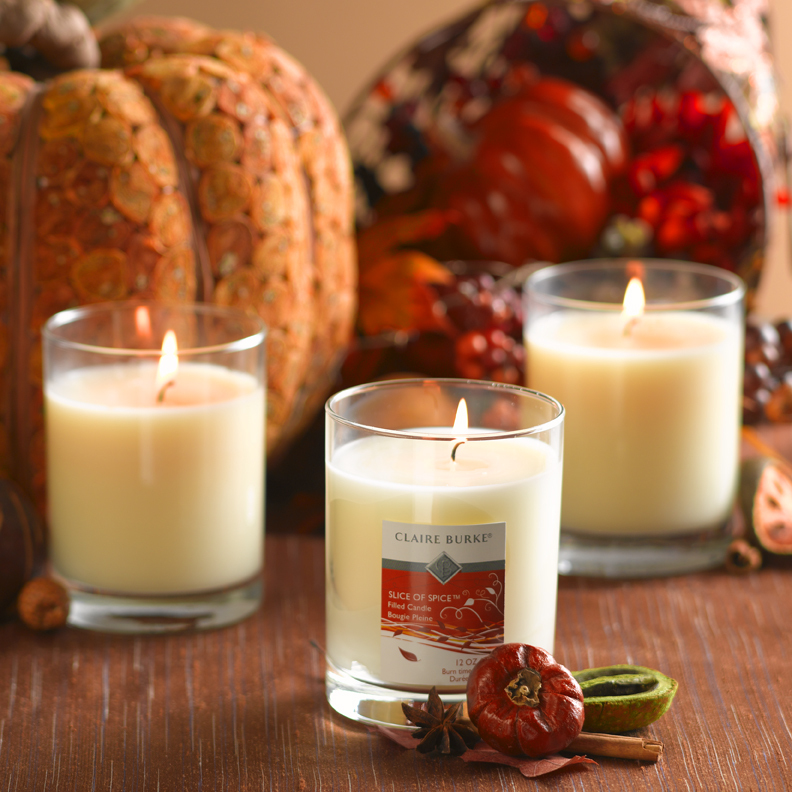 A Slice of Spice scented candle “the radiant glow and sweet scent of spiced pumpkin and cream cheese icing in our filled candle makes any room inviting.” Is a glowing reminder of the pumpkins that we’ll use in a few weeks for Halloween! In years gone by the candle was the sole means of light when the summer sun had faded from the sky. 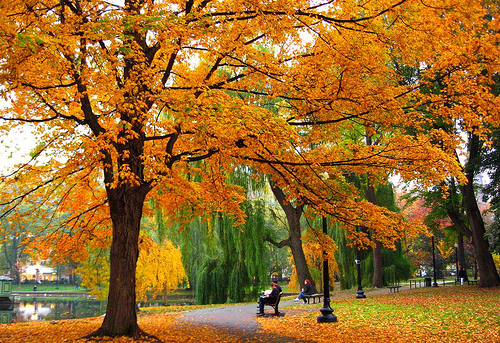 Fall crept up on us like the close bosom-friend of the maturing sun; as John Keats once said. But these were utilitarian objects, not the evocative and deliciously scented creations we enjoy today! Bringing a feeling of plenty and an aroma to relax with, a scented candle such as the Slice of Spice makes the perfect choice for that inexpensive but invaluable gesture of friendship. A gift is usually given as an expression of gratitude and a desire to please so a scented candle is especially appreciated. Yes we all have candles that are still in their wrappers, bought in a fit of enthusiasm or for a friend who we failed to meet up with subsequently. But these impulse purchases can now be put aside and with confidence you can flood the halls with memories of a summer just past but forever present in your memory. A gift of a scented candle is so much more don’t you think? I do and I’m heading for the store right now! Can’t wait to see the delight on the face of my friends. Well I’ll keep some for myself can’t let them have all the fun can we? We could even get a copy of Keats’s masterpiece and include this as a very special slice of poetry with our gift tag. Now that would be a real gift! So this Wednesday, September 22nd, is the first day of fall. Yippee! I love the fall season. The morning and evening air gets a bit crisp. Maybe even a hint of frost appears on the plants at dawn. And the tree leaves overhanging the street change into a myriad of vibrant, warm colors. I love dragging my feet down the sidewalk through the fallen leaves, listening to the high school marching band practice before school. I cherish watching the kids jump into huge piles of leaves we have raked in the back yard. And I treasure my sweaters and scarves, pulling them out from the armoire, just like they were newly unwrapped gifts to snuggle into. Start with a bowl of red ripe apples for a pretty centerpiece in the kitchen, living room or dining room. Add Applejack & Peel potpourri to the bowl to enhance the look and scent. 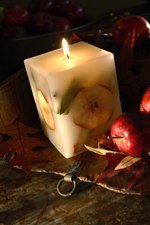 Plug in an electric fragrance warmer to further infuse the room with the scent of fall apples and orange peel! A few weeks later, sprinkle some fall leaves on the buffet, dinning room, or sofa table. You can pick them up on your morning walk or buy some amazingly real looking artificial leaves at the craft store. 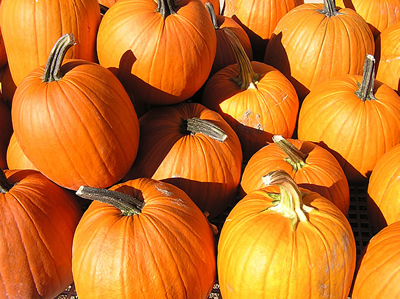 Come October look for dried gourds, pumpkins and corn husks at the local market. Replace the apple centerpieces with fall harvest and create autumn inspired focal points in your major living areas. I like Slice of Spice because it is perfect for decorating from fall through Halloween and up to Thanksgiving time. Slice of Spice is a yummy scent of pumpkin and allspice mixed with delicious cream cheese icing and shredded carrot, topped with notes of maple syrup and rum. Pop in a Slice of Spice Electric Fragrance Warmer in your kitchen and all your friends will think you have been baking pumpkin pies all day. Or place 20 drops of Slice of Spice Refresher Home Fragrance Oil in a tea light warmer or light ring to fragrance other rooms of your home. Near the end of October, add traditional Halloween décor, Jack-o-lanterns and The Haunted Home Spooky Candles. Then, come November, replace Halloween decor with a “horn of plenty” in anticipation of Thanksgiving gatherings with good friends, good food and good cheer! 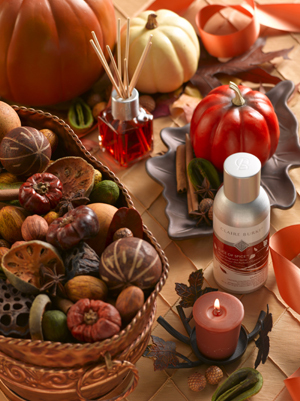 So rustle some leaves, bake some pies, and decorate with fall fragrances. SAVE 20% on Slice of Spice, just in time for Fall Decorating. Limited Time Offer. The busiest season of the year is fast approaching. The cold breeze signals it’s the perfect time to start thinking about gift giving, and not just for the holidays! Claire Burke’s Applejack & Peel® Home Fragrance Collection offers the scent of a luxurious home worth returning too, especially as the cool seasons approach. There’s a perfect Applejack & Peel® product for the people you value most! The best thing about them is that you don’t have to spend too much (mostly less than $10 and some less than $20!) Just add some creativity and personal touches to make your gift worth giving! For birthday celebrants. Let them experience the best on their birthday with Applejack & Peel® Petite Gift Set for those 3 best selling products from Claire Burke or these perfect combinations of Applejack & Peel® Potpourri and Applejack & Peel® Refresher Oil Spray to make their home luxuriously great for that birthday party. For the bride. Give her some goodies for their first night as a couple with the romantic Applejack & Peel® Luxury Candle and Applejack & Peel® Mini Fragrance Diffuser. This luxurious four-wick red candle and apple fragrance diffuser sets the romantic environment perfect for that lovely honeymoon! Personalize it by grabbing some permanent ink and write the name of the couple on the glass with a heart between their names! For your new neighbor. 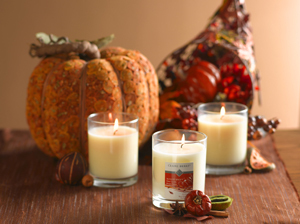 Make a good start and a perfect welcome by giving them the luxurious Applejack & Peel® Filled Candle. For the favorite teacher. Those hardworking hands need relief after a long-day of writing on blackboards and checking homework. Give the gift of Applejack & Peel® Hand Soap with Glycerin. For your mom or grandmother that you miss. Make them remember their own botanical garden and let them soothe their senses with the spectacular Applejack & Peel® Deluxe Botanical Candle for those visuals of leafy greens, ripe apple slices, cinnamon sticks and the smell of apple cinnamon spice! For the boss. Been dreaming of having that Monday without your boss following-up on tons of pending jobs from you? Give her this special Applejack & Peel® Travel Tin Candle and make her smell the luscious aroma and feel that tranquility with this elegantly compact travel-sized candle that she can bring whenever she goes on a weekend business. Candles – The more, the merrier! 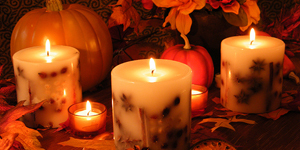 Candles are made in all shapes, sizes, colors, textures and scents. They may be elegant or casual, charming or chunky, classic or silly, conspicuous or understated. All which make them perfect little helpers for decorating any space of your home, any day. No doubt, a single candle can simply create a beautiful centerpiece to any room… Distinctive, understated, standing strong with it’s warm glow. So don’t get me wrong, but I believe that 1+1=3 when it comes to candles. The more, the merrier. Here are some creative ways to decorate differently, with candles, candles, and more candles! Add Drama – Make a statement or set a romantic mood with this contemporary look! 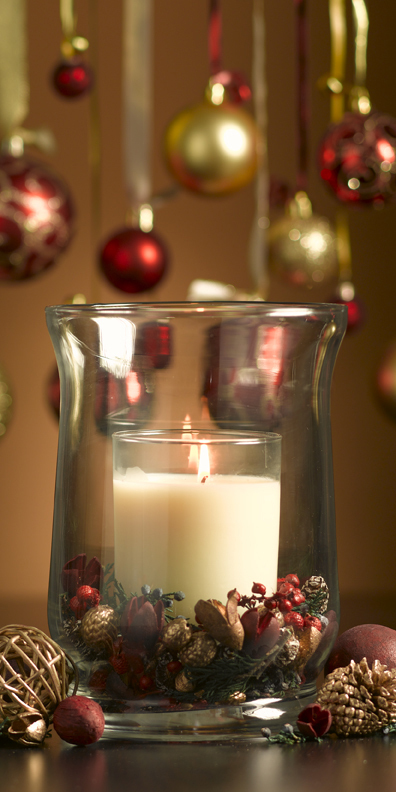 Place multiple tea light candles in a large glass vase or potpourri bowl. It is sure to be the focal point of any room! 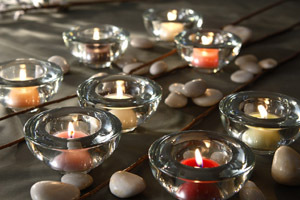 Be Reflective – You can easily “expand a room” by placing lit candles in front of a mirror. 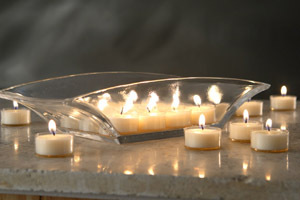 This classic trick turns a few candles into a family of illuminating wonders, “inviting” friends into your home. Celebrate with Color – Don’t be shy, this trendy look will “wow” your guest’s senses. Multiple tin candles bundled together will visually stimulate your eyes and blast your senses with a wildly impactful blend of fragrances. Create a Warm Glow – Place candles of different heights and colors in your fireplace as a quick and easy alternative to building a fire. Decorative and safe, the warm glow can change the mood of a room, instantly. Personal Bliss – Turn your bathroom into a relaxing and peaceful spa. Place multiple tea lights and polished stones on your counter, turn off the lights, and treat yourself to a relaxing bubble bath. So gather up all of your candles and find a focal point, create a mood, and make a statement. Have fun decorating with fragrance!